Sunday's Washington Post commemorated the 50th Anniversary of President Lyndon B. Johnson's “Great Society” programs with this memorable paragraph by Karen Tumulty that illustrates the great fault line in politics today better than anything we’ve seen in the establishment press in a long time. In other words, legislating and funding all of the federal programs that have contributed so mightily to the government’s $17 trillion-plus debt, the vast liberty-stealing federal bureaucracy and the creation of a permanent underclass of welfare-dependent citizens bereft of the skills and the will to hold a job equals a "productive" Congress. One may apply the word "productive" in that way only because LBJ’s Great Society also changed America and American politics and culture in ways much more subtle, but more harmful. After the Great Society the definition of achievement, at least as it applies to the political class, was in essence rewritten. Prior to the Great Society America was a nation where achievement was celebrated as the measure of success and the path to upward mobility. Our heroes were Thomas Edison, Babe Ruth, Joe Lewis, George M. Cohan, Henry Ford and Abe Lincoln -- poor boys who made good and achieved much. And whose lives showed that with hard work (and a little luck) if you could figure out how to make an electric light bulb, sing or write a song, hit a baseball or build a better car than the competition you could succeed. After the Great Society, all you needed to be considered a success, especially if you worked for the government, were good intentions. Actually accomplishing what you set out to do, for example reducing or eliminating poverty or substandard schools wasn’t necessary as long as the government and its vast new bureaucracies (and the politicians who supported and funded them) had good intentions. Imagine what America would look like today if Lincoln had accepted such a definition of acheivement? Americans were instinctively repelled by this redefinition of achievement and what was not so much a “War on Poverty” as it was a war on traditional America and its values. As Ms. Tumulty and her collegues at The Washington Post noted, “LBJ was elected in 1964 with what was then the biggest landslide in U.S. history. Just two years later in the midterm contests, his party lost three seats in the Senate, 47 in the House and eight governorships. Republicans would win five of the next six presidential elections. Among those presidents was Ronald Reagan, who memorably said that the United States had waged a war on poverty and poverty won. Big government has always topped big business and big labor in Gallup’s survey of American’s opinion about what is the greatest future threat to the country; including in the initial asking of the question in 1965 at the height of the push to enact the Great Society. The political inheritors of Lyndon Johnson’s Great Society are of course still with us, one of them sits in the Oval Office right now, but according to Gallup Americans have been skeptical of big government since the start of the Great Society. Today, seventy-two percent of Americans tell the Gallup organization that big government is a greater threat to the U.S. in the future than is big business or big labor, a record high in the nearly 50-year history of this question. The prior high for big government was 65% in 1999 and 2000. Yet with that level of public opposition to big government establishment Republicans have been unable to muster the political will to defund the failed welfare state created by the Great Society. The Great Society programs are "more entrenched" than ever because, even though American skepticism of the Great Society and the big government it created have never been stronger, the embrace of the Great Society’s big spending and big government by the Republican establishment has never been tighter. The key impediment to undoing the damage the Great Society has done to America over the past fifty-years is not the Democrats who created the vast welfare state the Great Society needed to perpetuate itself -- it is the establishment Republicans who have continued to fund it. As CHQ Chairman Richard Viguerie observed in his new book TAKEOVER, for the past fifty years conservatives have had their political guns trained on the wrong target. Far from shrinking government, whenever they have been in power establishment Republicans have contributed to the growth of government. What's more, tday's GOP leadership can’t hide behind the excuse that they only control one-half of one branch of government—when Republicans had the White House, House of Representatives, and Senate, spending increased even more than it did under LBJ. An honest appraisal of history will show that the key impediment to undoing the damage the Great Society has done to America is Capitol Hill's Republican establishment. Starting with President Richard Nixon and continuing through the two Presidents Bush, Speakers Hastert and Boehner and a series of Senate Republican Leaders like Howard Baker, Bob Dole and Mitch McConnell, the Republican establishment has steadfastly refused to defund the Great Society. We conservatives have had our political guns trained on the wrong target. We’ve been focused on defeating the liberal, Big Government Democrats, when the first, and most important, roadblock to our goal of undoing the damage the Great Society did to America and governing America according to conservative principles is the progressive, Big Government Republicans. Until conservatives control the Republican Party and nominate conservative candidates who will actually fight for and govern according to the conservative principles the party stands for, there will be no coherent alternative to the Democrats’ Big Government worldview presented to the voters, and little likelihood that we conservatives will achieve our goal of dismantling LBJ's Great Society and governing America according to conservative principles. 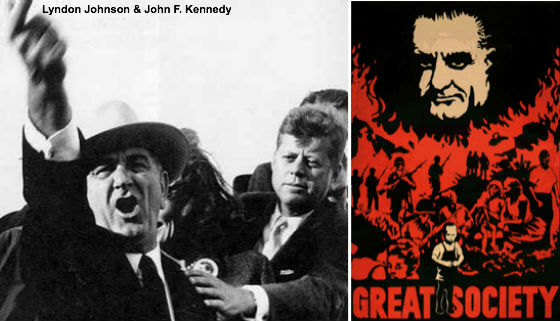 YES...LBJ's Great Society: The Establishment's War On America!! Submitted by louapa on Mon, 05/19/2014 - 13:28. SUBJECT: YES...LBJ's Great Society: The Establishment's War On America!! and it's Poor!! This entitlement plan, although well meaning, HAS BECOME A TERRIBLE WEIGHT AROUND THE NECK OF America IN FAVOR OF THE POOR who, as a group of Democratic voters, LBJ said would now support the Democratic Party for the next 200 years as depend slaves of the Party of welfare freebies! Shameful history period of our Nation!